Genetic approaches have revolutionized our understanding of the fundamental causes of human disease by permitting the identification of specific genes in which variation causes or contributes to susceptibility to, or protection from, disease. More than 2,000 disease genes have been identified in the last 20 years, providing important new insight into the pathophysiology of diseases in every field of medicine. Genetic Diseases of the Kidney offers expert insight into the role of genetic abnormalities in the pathogenesis of abnormal kidney function and kidney disease. Genetic abnormalities are carefully presented within the appropriate physiologic context so that readers will understand not only which genes are linked to which diseases but also which pathways lead from a genetic “disturbance” to the systemic appearance of disease. I. General Background: Principles of Mammalian Genetics. Approaches to Identification of Disease Genes. Clinical Applications of Genetics. II. Primary Genetic Diseases of Nephron Function: Logic of the Kidney. Primary Genetic Diseases of the Glomerulus: Alport’s and Thin Basement Membrane Disease. Congenital Nephrotic Syndrome. Focal Segmental Glomerulosclerosis. Primary Genetic Diseases of the Proximal Renal Tubules. Diseases of Renal Glucose Handling. Diseases of Renal Amino Acid Handling. Primary Renal Uricosuria. Fanconi Syndrome. Proximal Renal Tubular Acidosis . Dent’s Disease. Primary Genetic Diseases of the Thick Ascending Limb of Henle: Salt and Potassium Handling (Bartter’s Syndrome). Renal Mg2+ Wasting Due to Paracellin-1 Mutation. Ca2+-Sensor Receptor-related Diseases. Primary Genetic Diseases of the Distal Convoluted Tubule and Collecting Duct: Gitelman’s Syndrome. Syndrome of Hypertension Plus Hyperkalemia. Liddle’s Syndrome. The Syndrome of Apparent Mineralocorticoid Excess. Pseudohypaldosteronism Type I and Hypertension Exacerbated in Pregnancy. Distal Renal Tubular Acidosis. Nephrogenic Diabetes Insipidus: Vasopressin Receptor Defect. Nephrogenic Diabetes Insipidus: Aquaporin-2 Defect. III. Genetic Abnormalities of Renal Development and Morphogenesis: Overview of Renal Development. Polycystic Kidney Disease. Juvenile Nephronopthisis. Medullary Cystic Disease. Renal Dysgenesis. IV. Inherited Neoplastic Diseases Affecting the Kidney. The Genetic Basis of Cancer of the Kidney. Wilm’s Tumor. Tuberous Sclerosis. V. Systemic Diseases with Renal Involvement: Monogenic Disorders. Nail-Patella Syndrome. The Systemic Anti-Inflammatory Diseases. Renal Defects Due to Mitochondrial Mutations. Primary Hyperoxaluria. Lowe’s Syndrome. Fabry’s Disease. Hereditary Fructose Intolerance. The Branchio-Oto-Renal Syndrome. Primary Metabolic and Renal Gout. Hereditary Cystinosis. Hepatorenal Tyrosinemia. Renal Disease in Type I Glycogen Storage Disease. Wilson’s Disease. Renal Hypophosphatemia Due to Intrinsic Renal Defects. VI. Systemic Hereditary Diseases with Renal Involvement: Multifactorial Diseases: Systemic Lupus Erythematosis. IGA Nephropathy. Type I and II Diabetes Mellitus. Susceptibility to Diabetic Nephropathy. HIV-Associated Nephropathy. Hypertension. "A fine book like this for nephrology is long overdue. The kidney, historically rich in its contribution to modern genetics, needs an authoritative landmark for new learning, understanding, and reference. Genetic Diseases of the Kidney is comprehensive, containing 47 well-written chapters that are edited beautifully. Clinicians, trainees, and scientists will easily marvel at seeming complexity made truly understandable. Written with clarity and acumen by leading authorities, it strikes the right balance between overview and detail. References to each chapter have been carefully selected to reflect a wealthy resource for further reading." "…The field of kidney diseases has been lucky to have Richard Lifton, one of the major figures in this revolution, devote his energies to syndromes causing kidney failure and hypertension. His discoveries have energized the field, bringing into it many exciting young investigators… The new textbook Genetics Diseases of the Kidney, edited by Lifton, Somlo Giebisch and Seldin, combines the expertise of genetics and physiology in an admirable manner. The chapters cover many practical and theoretical areas: from basic principles of genetic inheritance to detailed analysis of the many newly described syndromes of genetic renal disease. For the general nephrologist or internist there is also a helpful chapter on what is available today in genetic diagnosis – this should aid the clinician in testing and making the appropriate diagnosis. The explosion of recent genetic information had made the general textbooks of genetic medicine quite unwieldy but the publication of this textbook is a welcome addition and fills a real need. 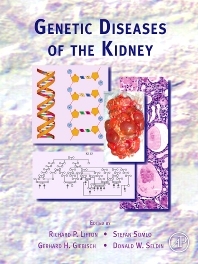 The identification of the function of such medically important genes makes this book essential not only for nephrologists but for all scientists interested in the structure and function of the kidney." "This multi-authored textbook, covering almost all of the inherited disorders of the kidney, is written by specialists running in the front row of this fast moving research field. I was quite impressed with the enormous amount of literature covered in each and every chapter of the book, reflecting the fast progress in this area of medicine. In this time of information overflow it is particularly helpful for busy clinicians to read accessible reviews that summarize the mountain of articles now available on every subject, and provide the necessary links needed to understand the bigger picture. This book is a must have for all of those involved in the fundamental as well as the clinical research on kidney disease as well as doctors caring for patients."